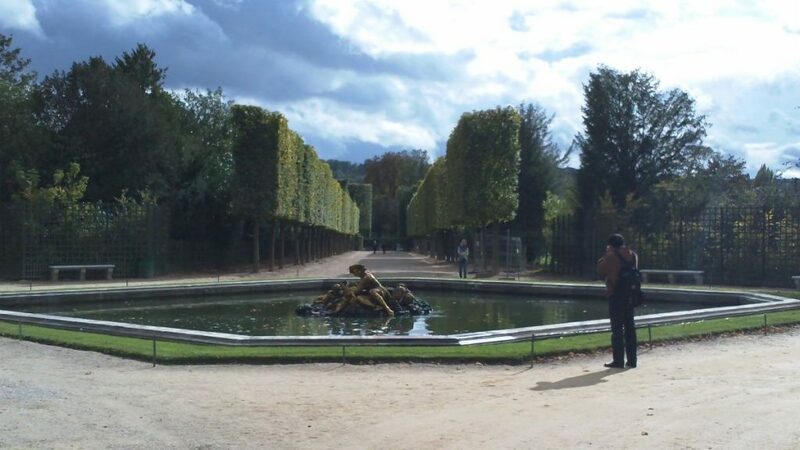 My last post covered our visit to le Château de Versailles. That grand old palace, built by Louis XIV, and now a museum is certainly amazing. But equally extraordinary are the surrounding grounds and gardens. The entire estate covers over 800 hectares or almost 2000 acres. That’s about twice the size of Vancouver’s Stanley Park or Perth’s King’s Park. It’s also larger than San Diego’s Balboa Park (1200 acres) or New York’s Central Park (843 acres). 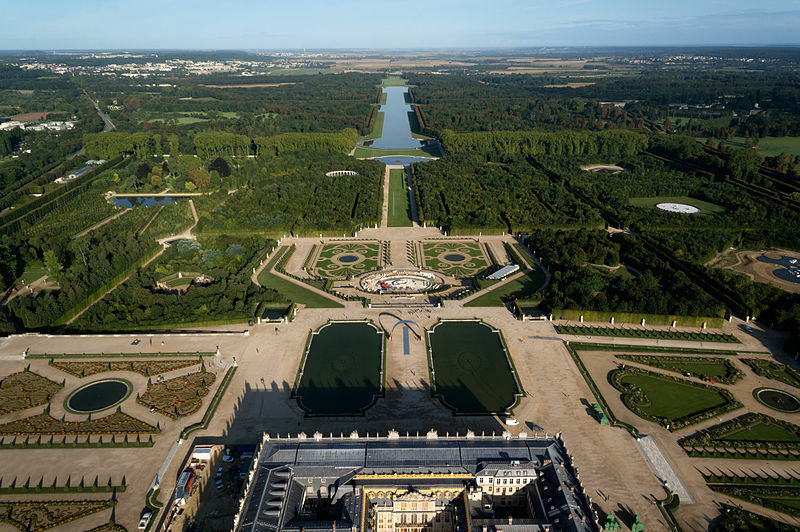 Louis the XIV commissioned the brilliant landscape architect André Le Nôtre to design the gardens and work began simultaneously with the Château. It took forty years to complete. The picture at the top of this article is an aerial view taken from a drone flown by ToucanWings and available through the Creative Commons. Below is an earth view Wikipedia map of the site so you can navigate around it. 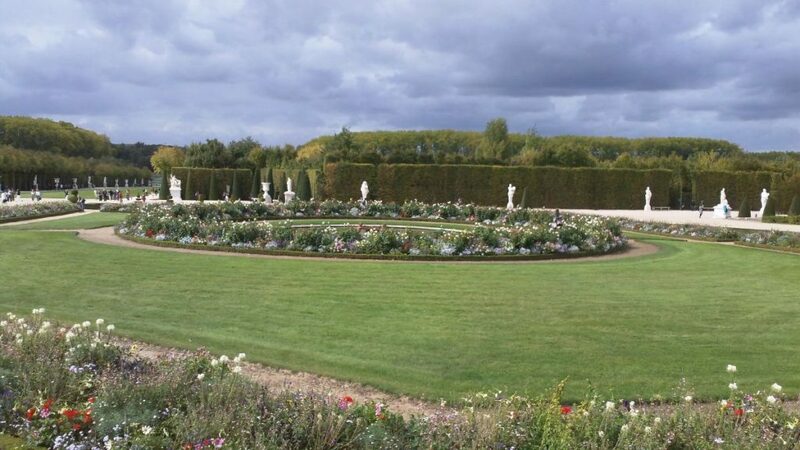 The gardens are in the classic French design – sculptured and symmetrical with many paths and flower beds. There are also a great many fountains as well as Greco-Roman sculptures. We caught our first glimpse of the gardens as we were exploring the north wing of the Château. The North Parterre seen from the 17th Century Galleries of the Chateau. The photo doesn’t do it justice. We saw more of the gardens as we continued our tour of the Château and from the fabulous Hall of Mirrors, we could see the whole landscape laid out before us. The gardens as seen from the Hall of Mirrors. 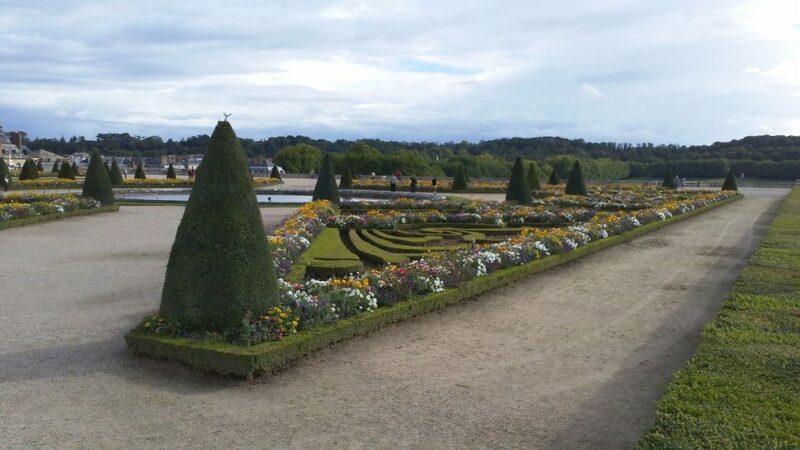 In the foreground is one of the two pools of the Water Parterre which is flanked on either side by the North and South Parterres. In the distance is the Grand Canal. After completing the Château tour we exited near the North Parterre and started to explore. 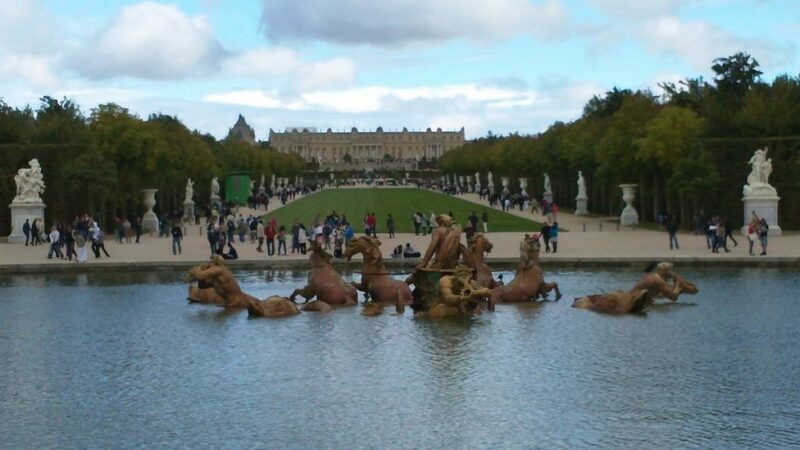 Behind the Château are two large pools on a plaza and directly behind that is the Latone Fountain, one of many to be seen here. Overlooking the gardens from the Latone Fountain to the Grand Canal. 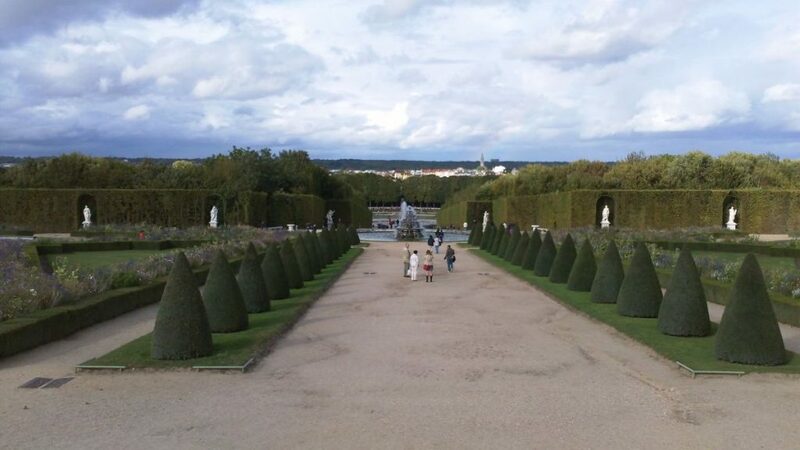 Since we were there, the gardens just beyond the fountain have been rebuilt in the French formal style. While the gardens cover a large area, an even larger parkland lies beyond, transected by the Grand Canal, a large man-made waterway in the shape of a crucifix. 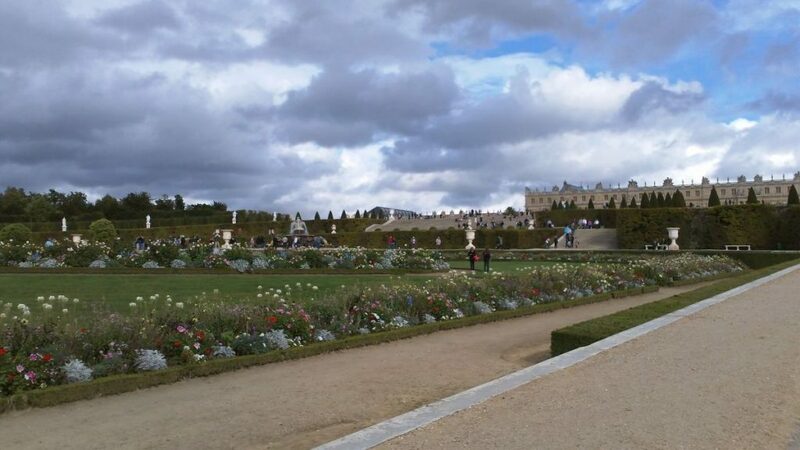 We’ll come back to the gardens flanking the Château and plaza, the parterres, later. But first let’s wander through the gardens below and see some of the sights. 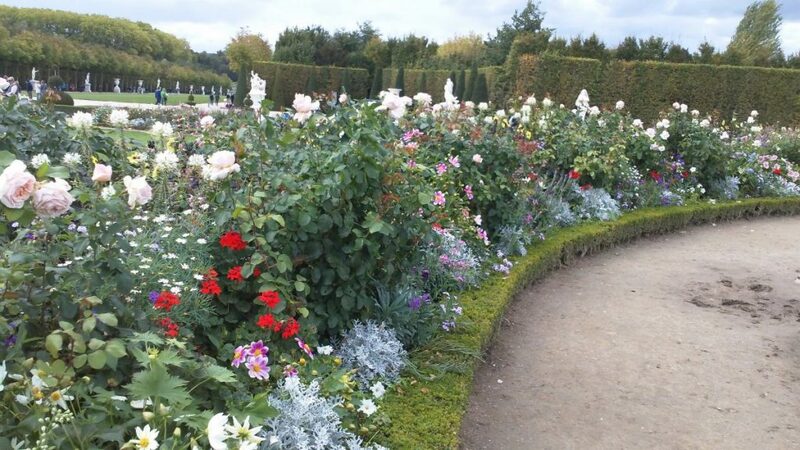 Flowers abound, set in symmetrical beds surrounded by paths and manicured lawns. A blaze of color. Manicured lawn and cultivated flower beds abound. These have since been redone in the classic French style. We strolled leisurely down the Allée Royale, two wide paths with a lawn between them and flanked by groves on either side, to the large lake and fountain that separates the chateau’s gardens from the Grand Canal and its surrounding woodlands. This fountain is truly spectacular. It shows Apollo driving a chariot pulled by mighty horses emerging from the water. Circumnavigating the fountain we get a spectacular view looking back at the Château. 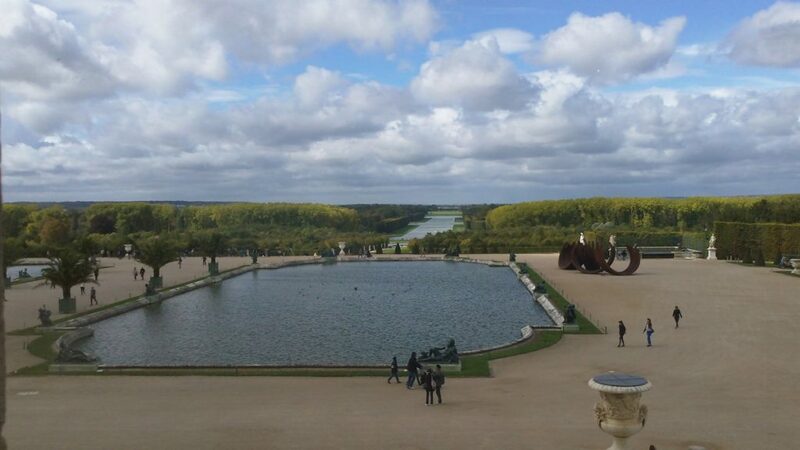 The Apollo Lake and Fountain with the Allée Royale and the Chateau de Versailles in the background. Below is a video of the fountain in action. After grabbing lunch at one of the two restaurants at this end of the Grand Canal, we strolled back up the Allée Royale and over to the Collonade Grove. It features a circle of thirty-two marble pillars surrounding a statue at its center. The circle of columns has a diameter of forty feet. Built in 1685 by Jules Hardouin-Mansart, it replaced the original Spring Grove built by Le Nôtre. The marble statue was created in 1696 by master sculptor François Girardon. 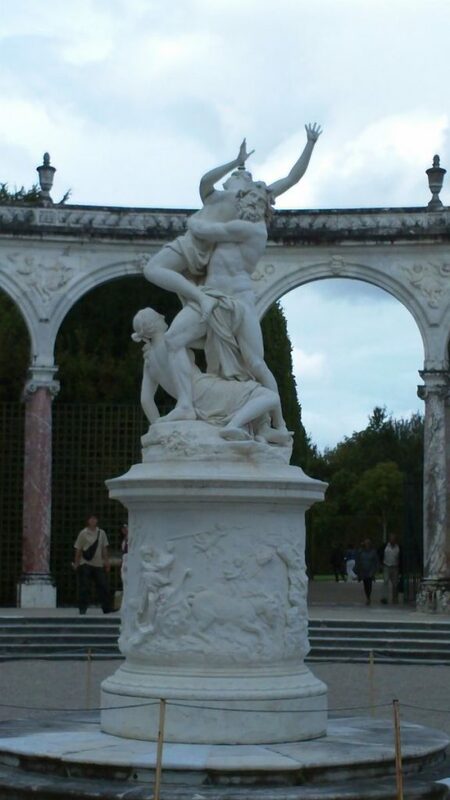 It depicts famous scene from Roman mythology, The Abduction of Proserpine by Pluto. The story of Proserpine explains the changing of the seasons in Greek and Roman mythology. Her mother was Ceres (Demeter in Greek), the goddess of agriculture. Cupid’s arrow inspired Pluto to come out of Mt. Etna with four black horses to abduct Proserpine and take her to Hades to be his bride. Jupiter, Pluto’s brother, sent Mercury as an envoy to order him to release Proserpine. Pluto complied, but not before he had fed her some pomegranate seeds. These compelled her to stay six months of the year in Hades. So she apent the summer months with her mother who made the world fruitful. Then she returned to Hades for six months and her mother withheld her bounty from the earth. The paths through the various groves are almost maze-like with high hedges enclosing various spaces. We were wandering through the groves to the South of the Allée Royale when we came across the Bacchus Fountain. There are four such fountains representing the four seasons, Bacchus represents Autumn. They’re located at crossroads within the groves. The Bacchus or Autumn Fountain. Note the tall hedges lining the walkways. As we walked along we noticed a crowd had gathered to watch some dancing waters. The place was the Bassin du Miroir or Mirror Fountain, actually a good size lake. We got closer and watched as the waters danced in time to the music coming from nearby speakers. We made our way back to the Latone Fountain and the flower beds nearby. Then we wended our way to the South Parterre. Gardens below the Latone Fountain with the Chateau in the background. 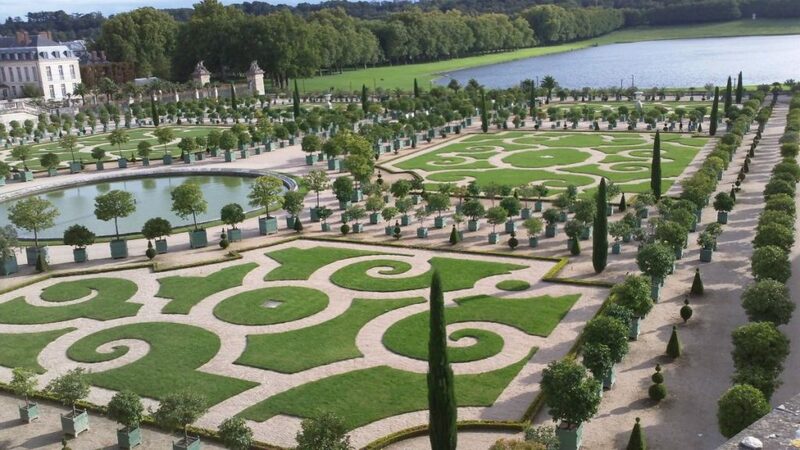 This was reconstructed in 2015 as the Latona Parterre, a more formal garden in the French style. The South Parterre sits above a large building called the Orangery or Orangerie. I’d never seen or heard of the idea until our trip to Europe where Orangeries sprang up in the 17th to 19th Centuries. They are large conservatories where ornamental shrubs, trees and plants imported from warmer climates could be housed during the winter. We saw an Orangery beside the Luxembourg Gardens in Paris. 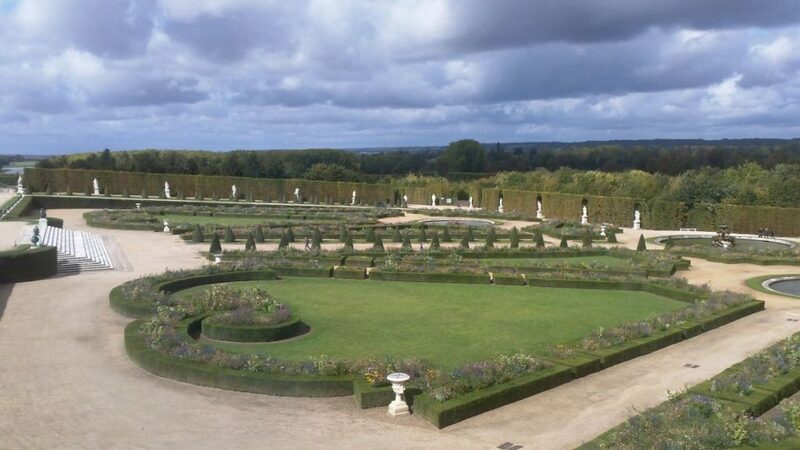 This is the South Parterre seen from the Salon of Peace in the Chateau. The Orangery is beneath this garden. The South Parterre built in the formal French style. Wandering to the edge of the South Parterre we come to an overlook and some magnificent gardens below. These gardens are the Orangery Parterre. The lake beyond is the Lake of the Swiss Guards. These gardens are below the South Parterre and directly in front of the Orangery which you don’t see because we are standing on top of it. From there we went back across the plaza of the Water Parterre to the North Parterre. Our schedule showed that the daily display at the Neptune Fountain was soon to begin. 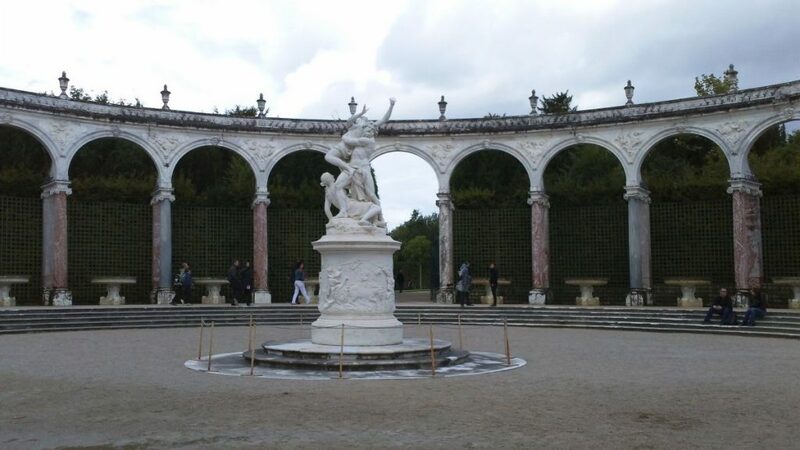 The Neptune Fountain is a large fountain found at the end of a broad path down the center of the Parterre. 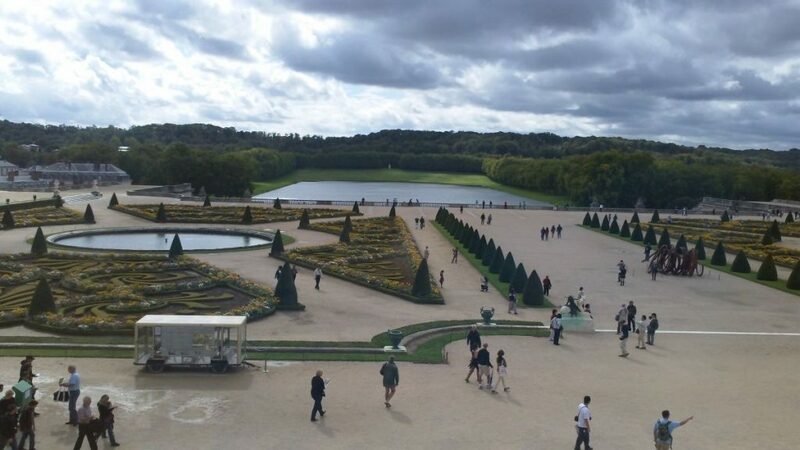 The walkway down the North Parterre leads to the Pyramid Fountain and continues past it to the Dragon Fountain and the Neptune Fountain. Te Neptune Fountain is huge. Like all the major fountains, the water show is set to music. Although we spent most of the day at Versailles, we only saw a small fraction of the sights to be seen, both in the Château and on the grounds. We did not venture far up the Grand Canal and we did not see the Grand Trianon, which lies part way up the canal. It is a large estate that includes the Petit Trianon, a smaller residence that was used by Marie Antoinette as an escape from courtly life – a private sanctuary. The Château and grounds are also illuminated at night. 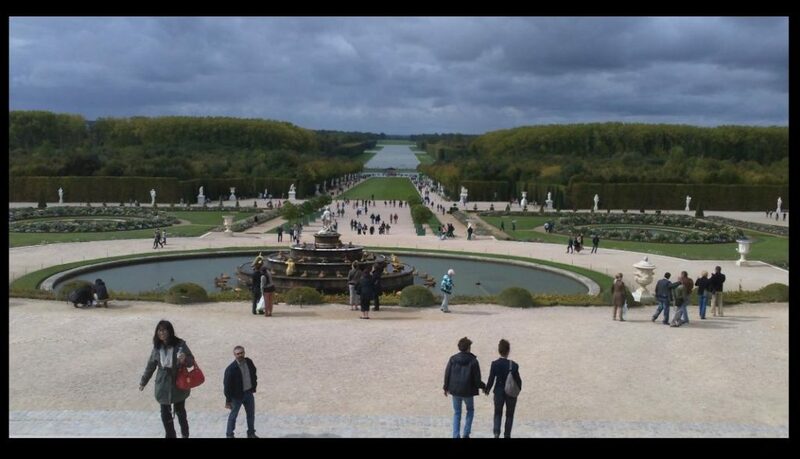 So when we return to Paris, hopefully in the next year or two, we will definitely see Versailles again. It is truly one of the wonders of the modern world. If you’re on the main page of this blog, scroll on through for an additional photo gallery. Otherwise click on the link below.